Acer palmatum 'Beni-komachi' is thoroughly deserving of its name which translates to "Beautiful Red Little Girl". 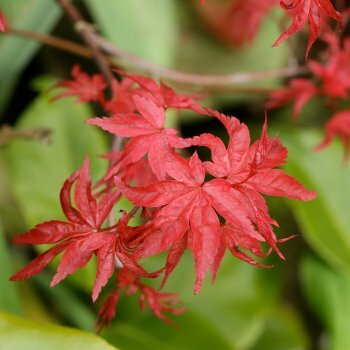 In spring, this dwarf Japanese Maple has delicate looking yet intensely coloured true red new foliage. In summer, the foliage turns dark-green with purple tinged edges and then develops outstanding vibrant scarlet tones in autumn. Remaining small and only reaching a height and spread of 2 x 2 metres in full maturity, Acer palmatum 'Beni-komachi' is ideal for small gardens or growing in a container. It is suited to all reasonably well-drained soils and prefers a position receiving full or partial sun. Pot grown Beni-komachi Japanese Maples can be planted at any time of the year. Firstly, remove all weeds and grass within a metre of your desired planting hole then dig a square hole as deep as your root mass and approximately 2x as wide. To help your tree establish more effectively, we advise sprinkling root grow in the hole, especially if you have poor soil.